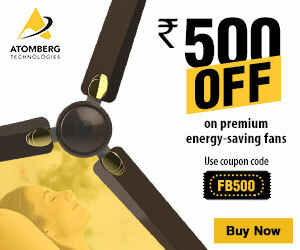 Recently we got a question on our website: “Ceiling Fans, Pedestal Fans, Table Fans or Coolers, which one is most cost effective?” and we started thinking that we have covered a whole lot about ceiling fans on our website but there are lot of other type of fans that people buy and certainly they wonder which one to buy as the difference between all of them is not clear. Also one would like to understand which one is more effective in terms of cost, efficiency and performance. Now there can be several reasons one may have to choose one over another, we will just try to put our perspective and observations on various types of fans. Pedestal or Table fans are standing fans with smaller sweep (or the diameter). Smaller sweep lets them cover lesser area in a room if they do not rotate or swing option. Rotation along the central rod lets them cover more area, but the same causes intermittent airflows in various directions. They are typically placed in a corner or a particular location of the room, and if the room is big, the air may not reach all places. They are good for creating airflows in smaller areas or if airflow is required in a specific part of the room. During one of the household audit done by Bijli Bachao team, we observed that a pedestal fan was consuming 50-55 Watts on different speed levels (slowest consuming 50 Watts and fastest 55 Watts). Ceiling fans are available in various sweeps (or diameters). Sweeps determine the area the fan can cover. Regular fans (most commonly available in market or most commonly used) are of 1200 mm sweep. Although there are smaller sweep fans available as well. Ceiling Fans typically cover larger area because they typically placed centrally in a room and also because of the elevation. Till now the most common fans available in the market (those that were not rated by BEE) typically consume 70-85 Watts. Even the ones of smaller sweeps (similar to sweeps of pedestal fans) consume similar wattage (you can check more on wattages at our link: Compare BEE Star Rated Ceiling Fans and Un-starred fans for electricity savings). But the BEE 5 star rated ceiling fans provide much more energy saving as compared to pedestal fans or regular ceiling fans as they consume about 45-55 Watts. Though their air delivery (or airflow) is slightly less than regular ceiling fans, but it the difference is not noticeable in regular use. The latest news that we are getting from the ceiling fan market is that new Super Efficient ceiling fans are entering the market that consume just about 30-33 Watts and provide similar airflow to any regular ceiling fan. More about them later when we get further details. Coolers serve a very different purpose, especially in summers. Along with creating airflow they also cool the air (typically using water). They have a fan as well as a motor, and thus the electricity consumption is more as compare to any of the fans. Typical coolers observed in the market are rated about 100-500 Watts (depending on the size and make). Why are ceiling fans becoming more efficient by each passing day? Ceiling fans have a bigger market and being one of the appliances that have high usage in any house or office, they are getting lot more attention in terms of technology improvement. There is a lot of focus of the government in making ceiling fans efficient. Thus the wattages of ceiling fans are coming down by each passing day. Whereas other types of fans are not looked at yet (may be they become more efficient in future) as there is a smaller market for them. On all parameters BEE 5 star rated ceiling fans are the most effective solution available in the market currently. We would always recommend buying them unless you have a requirement in a small area (say a kitchen or a reading room) where you can go for a pedestal fan.